Living in Central Florida, I don't see much of certain plants that are staples in traditional diets. One plant in particular, Chickweed, I've always read about, but never actually had a chance to see. One day, I noticed a plant that looked a lot like the typical description of Chickweed that I'd read about for years. Vaguely heart shaped, opposite, leaves. Ground cover with tiny white flowers. It even has an elastic inner core. However, it was not fuzzy and the leaves were a bit bigger than I was lead to believe. A few years later, I was taking a class and the teacher pointed to this exact plant and called it Drymary, or Tropical Chickweed. Eureka! It may not have been a true Chickweed, but it was a very close cousin. So close, in fact, that traditional medical systems across the world use them in many of the same ways. Since then, I have seen Chickweed (though here it's season is much, much shorter than in cooler climates), but I also have gained a great amount of respect for Drymary. Parts Eaten- Tender young leaves and shoots are eaten raw or cooked. The leaves, at any age, can be eaten raw in a salad or cooked as a pot herb. Summary of Actions- Appetizer, depurative, emollient, antidote, cooling, febrifuge, laxative, mild analgesic, and stimulant. Upper Respiratory- Many cultures around the world use this herb in various upper respiratory ailments. Smoking the dried leaves is said to help treat bronchitis. Drinking the juice or a tea made from the leaves is said to help with asthma, bronchitis, colds, and upper respiratory infections. Snake Bites- In China, the leaves are crushed and placed on top of a snake bite to help counter any venom that may be present. Burns- Drymary is both cooling and slightly pain relieving. This makes it great to help cool off burns. Wound Care, Eczema, and Psoriasis- This herb is a good wound herb. It helps cleanse the wound, provides mild pain relief, and can help speed the body's natural healing properties. It also helps, especially in the case of eczema or psoriasis, to soothe and protect irritated skin. Detox- One of it's main actions is as a depurative. Depurative herbs work on our body's natural detoxification system, helping to cleanse the kidneys, liver, and lymphatic system. Malaria- Native to the same areas of the world that are known for Malaria, Drymary is one of the standard herbs used to treat the infection. It's main use is to help reduce fever, which is one of the major concerns when dealing with Malaria. Possible Use for HIV Treatment- Recent studies have found that Drymary shows promise in treating HIV patients. Contraindications and Warnings- There are toxic look-a-likes found in many of it's natural habitats. Do not use or consume this herb unless you are 100% sure of it's correct identification. 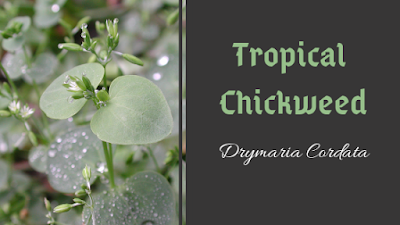 I only included a basic introduction to Tropical Chickweed. If you have any questions or comments, please leave them below.